ez1099 2018 Is Available for 2018-2019 Tax Season! 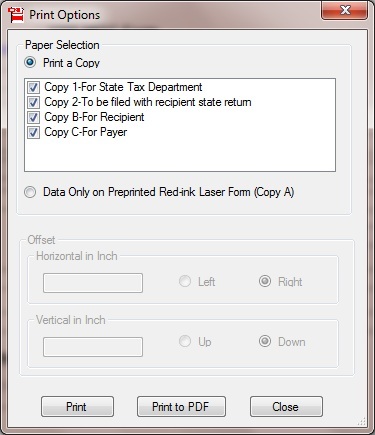 ez1099 can print all recipient copies on white paper. It can fill data on pre-printed forms too. IRS does not certify substitute forms. You need to print the data on the red forms for copy A and 1096.
ez1099 can generate the PDF format forms for recipient copies to help you cut the mailing cost. 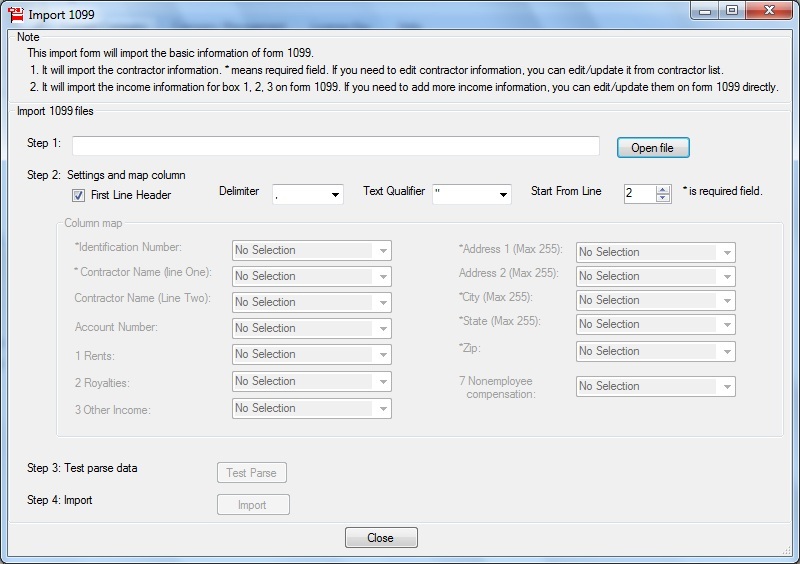 ez1099 also generates the electronic filing document that you can upload to IRS site. FREE download. No credit card is needed, no obligation and totally risk free! 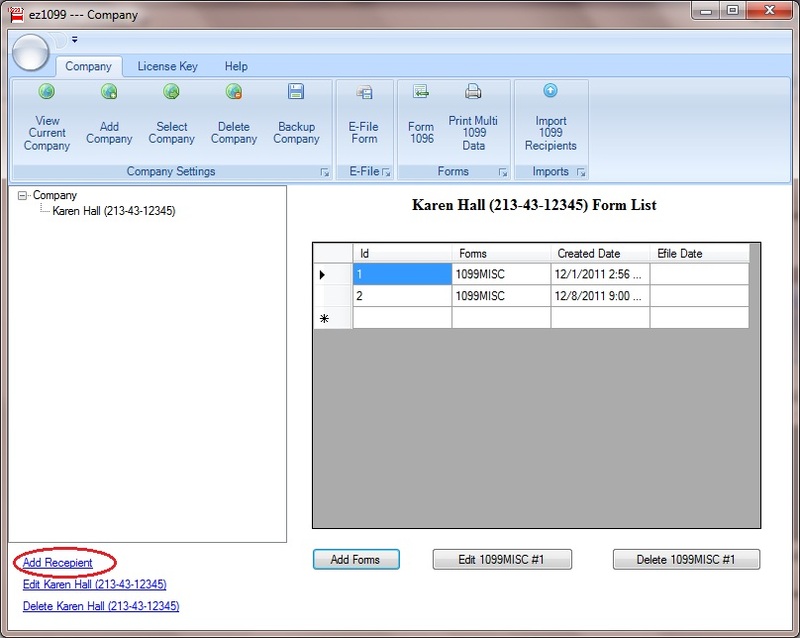 W2 and 1099 Reporting deadline - New Due Dates! Note: There will be only one single shipping charge for USPS Priority Mail. All Orders are shipped within 24 - 48 hours. on this form, user can enter the general company information for 1099 forms, such as Company Name, Address, Tax ID and others. ez1099 allows user to set up unlimited companies. User can see recipient list on this form. User can add a new recipient or edit or delete an existing one easily by clicking the link on this form. 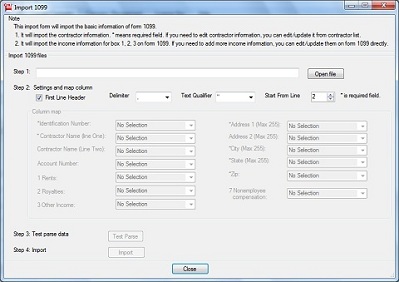 User can also import recipient information quickly by using 1099 import form. User can add or edit recipient on this form. - The recipient information will be filled automatically. - Select correct 1099 Form. 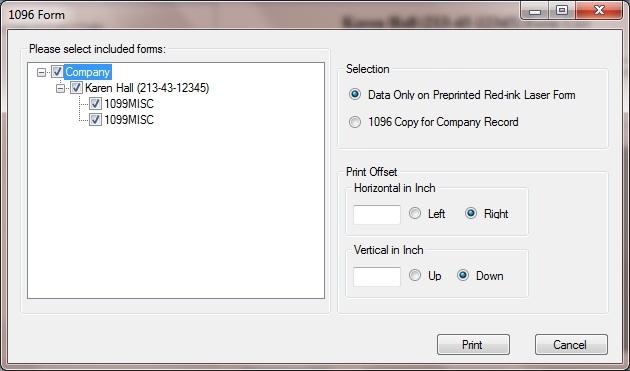 - Click the 'Print' button to print the different 1099 Copies for this recipient. 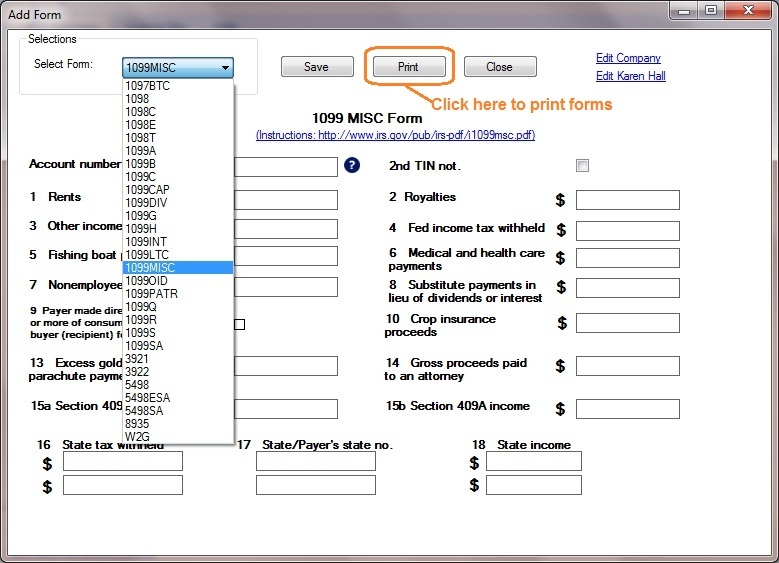 - When print 1099 data on pre-printed form, you can only print one form form this page. 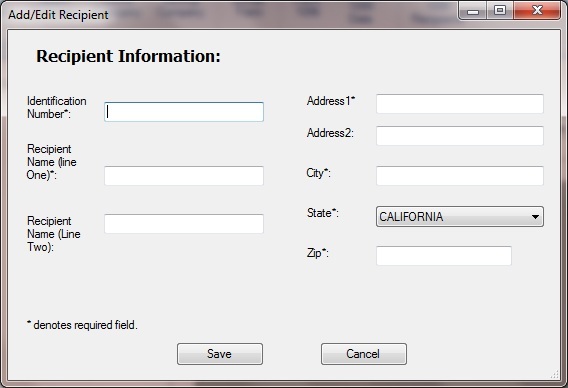 For multiple forms print on preprinted forms, using "Print Multi 1099 Form" from main menu. - To save time, ez1099 can import 1099 data from the external .CSV file. - You can generate CSV file from MS Excel, MS Access, MS SQL, Oracle and so on. - You can also generate CSV file from lots of accounting and payroll software. 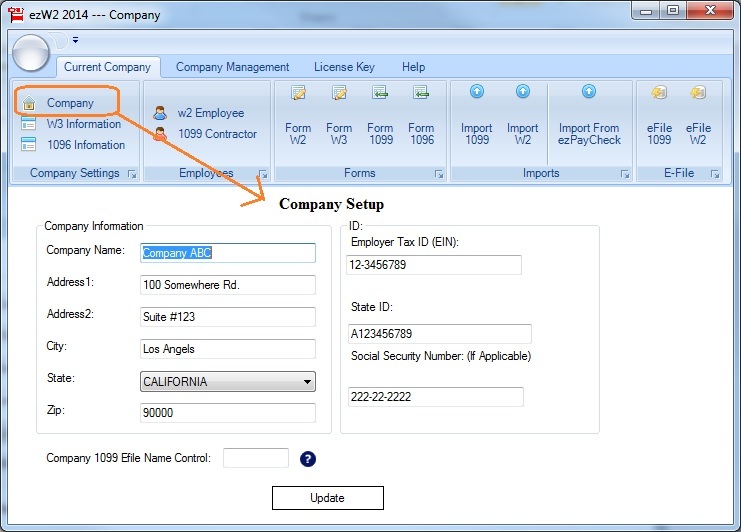 ez1099 will generate form 1096 automatically. User should pick the form 1096 Transmittal. Is ez1099 1099 printing software for me? Trying ez1099 is risk-free! It fits for any size company and offers flexible, easy to use features. Just feel free to download and try it. No registration needed. No Obligation. What forms does ez1099 1099 printing software support? I do not know much about accounting and computer. Can you use this ez1099 software? ez1099 somes with sample database. Once you install this software, you are ready to generate your forms for testing purpose. Please feel free to try it. With ez1099, do I still need to buy red ink substitute 1099 forms? If you do paper file, IRS required filing red Copy A forms. For eFile, no paper are needed. It is user's choice to select which type of form for submission. The other copies (Copy B, C, D, 1, and 2) can be printed on plain paper or use PDF file to recipients. Is the support free for ez1099? Yes, you can get free tech support from us by writing to services@halfpricesoft.com. Does the demo version have any limitations? Does the ez1099 support multiple companies? Yes. In theory, it can support unlimited companies if your hardware is big enough. You can add a new company by clicking the top menu "Add Company". What are the system requirements for ez1099 printing software? ez1099 can run on both 32-bit and 64-bit machines. Is your online checkout process safe? The payment is secure under SSL with 128bit encryption (Learn more about PayPal Encryption ). With PayPal you also have fraud insurance (Learn more about PayPal Buyer Protection). How long it takes to get the license key? Our system will send the license key to your email account once the transaction is completed. Usually, you can get it in 1 to 5 minutes depending on how often your mailbox is updated. Some mail servers may block messages sent by machine. If you cannot find the key in your Inbox folder or Junk Mail folder after one hour, please contact us at services@halfpricesoft.com. We are glad to send the key to you manually. What are the Forms included for 1099s? The ez1099 software supports W2G, 1097BTC, 1098s (1098, 1098C, 1098E, 1098 T), 1099s (1099A, 1099B, 1099C, 1099CAP, 1099DIV, 1099G, 1099H, 1099INT, 1099LTC, 1099MISC, 1099OID, 1099PATR, 1099Q, 1099R, 1099S, 1099SA), 5498s(5498, 5498ESA, 5498SA), 8935, 3921, 3922, 1096. Form 1096 (Annual Summary and Transmittal of U.S. Information Returns) is a compilation form which provides totals for all 1099 forms, including 1099-MISC forms submitted by an employer for independent contractors and other non-employees to whom payment was made during the previous year. Where I can find filing instructions for form 1099s? Where I can find filing instructions for form 1096? Where To File 1099 .